Beautiful and Artistic wedding photography that will simply please a bride and groom. Lucien's Manor is a premier venue with three beautiful banquet rooms. 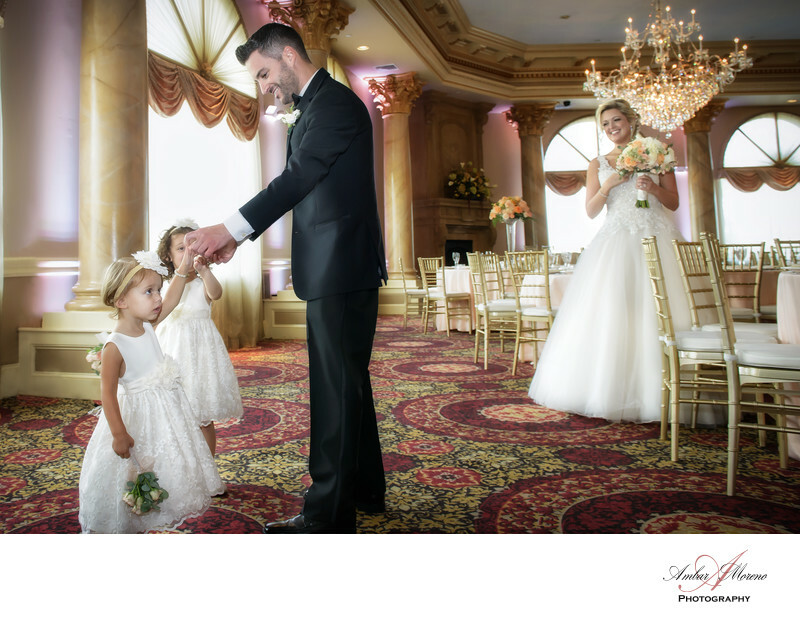 Your dream wedding will look magnificent with all those amazing photos we captured on that special day. Lucien's has three exquisite ballrooms, each unique and remarkable. They can accommodate everything from on-site ceremonies and smaller soirees to banquets for up to 550 guests or host an alfresco cocktail hour on the outdoor patio that overlooks the expansive ground. Day or evening, indoor and outdoor, photo opportunities abound with magnificent architecture backdrops. Make a grand entrance by way of your own private staircase, then dance the night away surrounded by family and friends. Cascading crystal chandeliers, marble fireplace, customizable lighting with accented classic French wall colors and tasteful decor set the tone for a most memorable event. The Versailles Ballroom can accommodate 150 to 200 guests. Distinctively designed with open floor plan and balcony for a birds eye view of festivities below, the Versailles Ballroom is an ideal reception venue. La Grande distinguishes itself with access to the outdoor patio that features a breathtaking indoor waterfall. Towering 20-foot ceilings adorned with sparkling crystal chandeliers, customizable up-lighting, and color-enhanced LED lighting along the gilded moldings of the coffered ceiling add to the drama of this lavish room, which can accommodate between 200 and 550 guests. With plentiful seating during cocktail hour and a spacious dance floor, La Grande Ballroom evokes the palatial ambience of Europe and is the perfect canvas for your once in a lifetime memory. Inspired by the palaces of Italy, the Venetian Ballroom is the epitome of elegance. Upon entering, your guests will be greeted by the gentle sound of water cascading down a tiled wall. In the opposite corner, a stately hand-carved fireplace adds additional ambience, while nine-foot arched windows, ornate crystal chandeliers, large marble dance floor, and state-of-the-art LED lighting bathe the room in a warm glow. Towering marbleized columns with gilded capitals stand sentry along the perimeter and surround a hand-painted faux sky ceiling. The wedding party enters the event down a grand staircase with an impressive scene-like backdrop. Guests can enjoy a private entrance, separate kitchen, bridal suites, and private rest rooms. Flexible floor plans can accommodate between 200 and 325 guests. The location is picturesque and it provides a variety of creative choices for photographing an amazing wedding. Every room in Luciens is magical and they have managed to create an impressive setting for all of them. Ceremonies can be held outdoors amid the lush landscaping or indoors which can accommodate 225 seated guests in the newly constructed chapel. If you like, Luciens will pull back the glass ceiling so your guest can enjoy the ceremony along with the beautiful weather. Amenities, such as white chair covers, ceremonial pillars, and a white lace-covered unity table is what they will offer you. The outside ceremony can also be held in front of the iron-and-marble gazebo with a waterfall as your backdrop. You would walk through a garden-like pathway to get to the patio. Once there, you are surrounded by the gorgeous landscaping and columns. The venue has a bright and inviting atmosphere. Its a wedding venue where couples love to celebrate their marriage. Location: 81 W White Horse Pike, Berlin, NJ. Keywords: Berlin (60), Lucien's Manor (3).